Kiichi Kawano established a Yokaren Museum in 1988 at his home in Ōita City. He was a member of the Navy's Kamikaze Special Attack Corps 7th Mitate Unit, which was formed at Kisarazu Air Base in Chiba Prefecture along Tōkyō Bay on July 25, 1945. The war ended before he made a sortie on his suicide mission. Kawano in this article relates incidents with two fellow kamikaze airmen: Flight Chief Petty Officer Kiyoshi Tanaka, who died in a special (suicide) attack on August 9, 1945, and Flight Chief Petty Officer Yoshiomi Nishimori, who died in a special attack on August 13, 1945. This article comes from pages 318-22 of the Japanese book Yokaren no gunzō: Moto shōnen kōkūhei no kiroku (Yokaren group: Record of former Navy youth pilots) edited by Ōita-ken Yūhikai and published in 1995 by Kiichi Kawano. Tōkyō first experienced B-29 air attacks on March 10, 1945. After that, the mainland suffered air attacks again and again. On May 25, the whole region of Tōkyō, Yokohama, and Kawasaki suffered intense bombings by large formations of B-29s that resulted in heavy damage. One day in July a crewman from a B-29 shot down by our air defense artillery fire descended by parachute to Tōkyō Bay. It was right in front of us at Kisarazu Base just a few hundred meters across the water. When the air attack warning was announced, everybody had rushed into the air raid shelter. We young crewmen, like young swallows poking out their beaks from the nest, gathered at the entrance of the air raid shelter and looked up anxiously at the skies. We watched intently the course of events of the air battle with the Gekkō (Irving) fighters that had taken off from Atsugi Base to intercept the enemy. After the aerial combat had ended, an enemy flying boat came flying in protected by Grumman fighters. Everyone was surprised when it landed on the water of Tōkyō Bay right in front of our eyes. Of course, all of our eyes were fixed on the flying boat. As we were thinking what it would do, the crew calmly lifted out of the water the American airman who previously had descended by parachute. Although it was the enemy, it was a brilliant rescue in which our military was regarded with contempt. It was an event lasting only a few minutes, and we could not even take captive the American airman before our very eyes. Unfortunately what the enemy just did could not help but make us angry. According to some accounts, if enemy planes did not approach to a very close distance subject to the limits of our bullets, then it seemed that our antiaircraft guns in those days could not fire. Also, the antiaircraft guns seemed to not be able to fire at targets below the horizon. We were struck for a moment by the landing of this flying boat right before us just after our fighters withdrew. When I saw this spectacle before us, I thought deep inside, "Japan has already lost." Only now can I say this, but at that time, as a member of the hot-blooded daring group of the 5th Attack Hikōtai (Squadron), I did not say this to anyone. Several days afterward on July 25, we all became a special attack unit named the 7th Mitate Unit, which would make final attacks. At the Ōtayama Family quarters, both our seniors in the Otsu Yokaren (Naval Preparatory Flight Training Program) and we younger airmen were living in the same lodging. It was the evening of August 8. My senior in the 15th Otsu Class, Flight Chief Petty Officer Kiyoshi Tanaka, was scheduled to depart the next day, the 9th, on a special attack. He bumped his head against a column in front of me. Petty Officer Tanaka said, "Kawano, that really hurt." "The instant you crash is no pain," I said. We laughed together, and that was finished, but I guessed his feeling. Not able to do anything for that indescribable feeling, I only said, "Tanaka, since I will soon be going after you, please go before and wait for me." I was treated especially kindly by Tanaka. A special attack unit had the fate that death certainly would come with only the date and time being different. It was often said, "Even the remaining cherry blossoms will surely fall." Every day aircraft crewmen flew off together with their coffins. Even now after 50 years have passed, this incident at Ōtayama on the night before the special attack has never left my mind. On August 13, the order was given for the 7th Mitate Unit 3rd Ryūsei Squadron to make a sortie on a special attack. 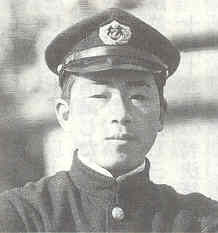 In that 3rd Ryūsei Squadron was Flight Chief Petty Officer Yoshiomi Nishimori, 16th Otsu Class, in the second plane of Section 1. Petty Officer Nishimori, a few hours before his takeoff, surprised me when he called me and said, "Kawano, will you swap your flight suit with mine?" I replied, "Nishimori, what's got into you?" He said, "On my trip to die I would like to go wearing your new flight suit. Exchange with me." Even though while thinking that I also would be leaving for a special attack in a few days, since it was my senior talking, I said, "Yes, I understand. Let's swap. Please go while wearing my flight suit." It was arranged that we would wear each other's flight suit. Since my own flight suit had become worn, I had gone to the quartermaster's warehouse and had just exchanged it for a new one. I quickly took it off and exchanged my flight suit with the one worn by my senior in this squadron before mine that soon would take off for a special attack. However, since our own names were written on the inside of each other's jacket, it felt somewhat strange. For the two of us destined eventually to cast ourselves into the southern sea, it probably did not matter at all whatever was inside the flight suits. Also, I told myself that it would probably be sufficient if we could exchange them in the next world. I laughed and sent him off. As for the lives of crewmen, one can say there was a thin line between life and death, but I never exchanged back the flight suit. Petty Officer Nishimori's flight suit is now permanently displayed at the current Yokaren Museum in Tsuchiura as an item that he left behind. Now when I think about it, my own flight suit at that time seems to have become my substitute that departed on a special attack. My body lived a long time. God has used me and left me to grant requests from the spirits of those many men who died in battle. I strongly desire peace as I tell future generations the truths of that disastrous war. Nishimori, my senior in the Otsu Yokaren, has his body wrapped in my flight suit at the bottom of the dark, cold southern sea. It gives me somewhat of an uneasy feeling, but please rest in peace. I really am praying for you. Kiichi Kawano kindly granted permission for translation and publication of this article.